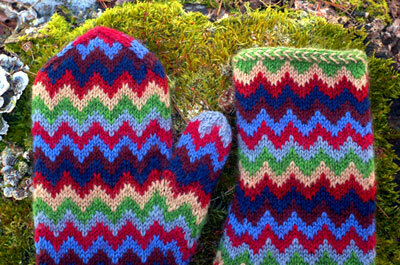 These were great fun to knit! The chart’s super easy to memorize on the first repeat, then off you go! 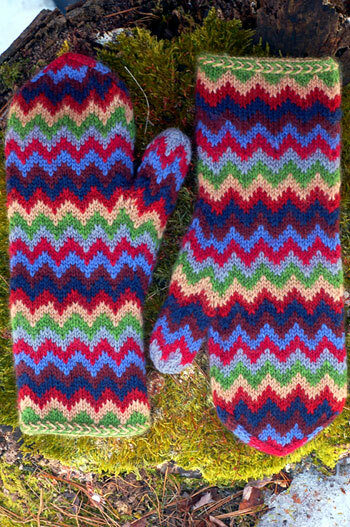 As a tester for this pattern, I got to pick my own colors, 8 in all, which was a blast. The skeins were lovely and sitting down to fiddle around with the color order once they got here was even more fun. The burning question may be, what to do with all those colors? 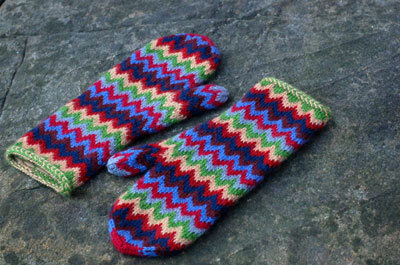 I carried all them up the inside of the mitten, twisting them into a rope as I went. Every time I changed colors, I wrapped the new color around the rope to secure it. It worked great and I don’t feel the “rope” when wearing the mittens. It took some getting used to the 8 little balls of yarn hanging off the mitten as I knit, but it’s absolutely preferable to cutting the yarn and having 9 million ends to weave in, at least for me. Fun to knit, absolutely lovely product, great yarn in great colors. What more could anyone want? Milk- I sadly missed all the Oscar-type movies in the theater, so we’re getting them from Netflix. Milk was so wonderful, wasn’t it? Sean Penn was lovable, spazzy and overly excited. Who knew? I’ve seen The Times of Harvey Milk a good few times and have such affection for him, so it was wonderful to have the affection carry over into the new film. Tilt-shift photography – I’ve made a few using this tutorial. There’s an online generator, as well. I need practice, but they’re such fun to make. James LeFleur. I love Sawyer all cleaned up! Everyday Food on Twitter. Just when you don’t know what to eat for dinner, some crazy sandwich is pointed out to you. Hi, folks! Thanks to all of you who have joined the potholder swap! We are so excited about this and happy to have you all participate in this swap. There is still some time left for those of you who are interested but have not joined yet. The deadline for signing up is midnight tonight. We’ve sent out some invites to the blog that weren’t used, so if you signed up but don’t see your name on the sidebar, please do not hesitate to email us with a link to use for you. Drop us a line at potholderswap2009@gmail.com so we can update the swapper list with your name and link. We won’t be able to add you to the blog as authors, because we’ve exceeded Blogger’s limit, but we can add you to the swap and put you in the sidebar as a swapper.Regarding fiber, we are specifying wool or cotton only please. The reason being that cotton ignites at about 410º Fahrenheit, and wool ignites at an even higher temperature and has excellent insulating properties, which is a quality one would want in a functional potholder. Cotton potholders and hot pads can be thrown in the wash where as wool might require a little bit more special attention. For more particulars regarding the pros and cons of what fibers to use for potholders, please see this discussion here. For this swap, however, we need you to use wool or cotton only please. We need to do some testing as far as superwash wool goes. We suspect it might be unsafe for potholders, but we’ll let everyone know in the next blog post. We’ll be sharing all further info regarding the swap on the swap blog. Look for posts there soon. 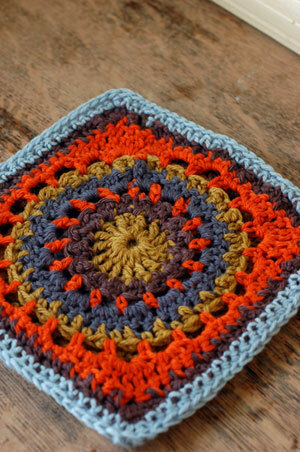 Crochet Mania and Potholder Swap! If you follow me on Flickr, you know that I’ve been having a bit of a crochet attack. This time, I’m all about the hot pads and potholders, with a small side of ripple blanket. It turns out the crochet attack is going around, and some of us got talking about starting up a swap for these hot pads and potholders, so that’s just what Maritza and I are doing. The goal is for each participant to crochet 5 beautiful potholders or hot pads and send them in. In return, you get 5 glorious potholders back. We’re aiming for something a little above and beyond the norm, here. 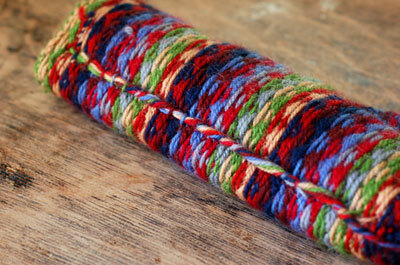 We want potholders that are super kitschy and fun, or extra beautiful (handspun?! ), functioning as useful objects as well as art. We’d love to have you join our swap. To participate, please email us at potholderswap2009@gmail.com. Deadline to enter the swap is 3/21/09. Please join us at the swap blog, as well! Now for the rules. They’re pretty basic, so here goes…. – US swappers., you must include a USPS Priority stamp for return postage with your potholders. Non-US residents are welcome, we’ll just need to work out how you pay for return postage with you. – have fun with this! We’re thinking that 2 months should be enough time for everyone to finish their hot pads/ pot holders, but we’ll post an official deadline and details as to where to mail them shortly, once we have all our swappers. 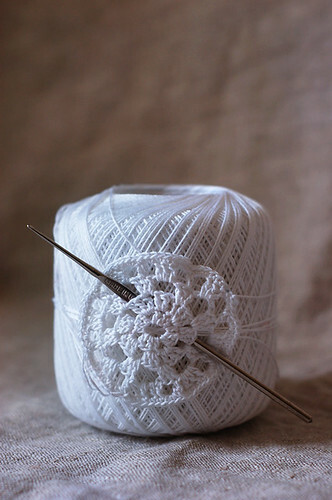 For now, there are a few wonderful resources for pot holder patterns, such as Crochet Pattern Central and the Crochet & Crafts Link Index, as well as an inspiration group we started on Flickr.